Nigerian music star, Davido, held his music concert at Eko Atlantic on December 27. Things seemed to have gone smoothly till reports filtered out that the star had slapped Kizz Daniel’s manager. The embittered manager, Tumi Lawrence, took to social media to call out the star and express his disappointment Kizz Daniel also made sure to show support for Lawrence by declining to perform at the show Organising events is not easy as the pressure often lies on the show host to bring out the best. However, that is no excuse for bad behaviours. Nigerians were thrilled to attend music star Davido’s music concert which held on December 27 at Eko Atlantic. The audience waited in anticipation for his joint performance with another music star, Kizz Daniel, but that did not happen. 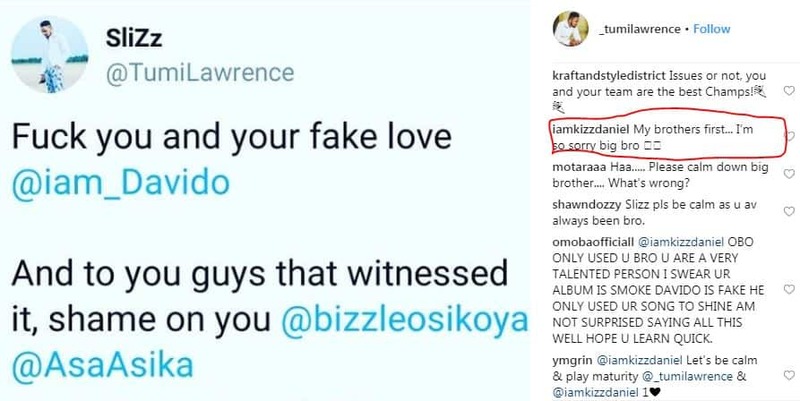 Later on, Kizz Daniel’s manager, Tumi Lawrence, took to his social media handles to slam Davido despite not revealing the reason behind his call out. A Twitter user, identified as Peter @peteruonion, took to his handle to explain what had transpired between Davido and Lawrence. According to him, the star had slapped the music manager and also poured his drink on him. To show solidarity, it was gathered that Kizz did not perform at the event but Davido still proceeded to perform the star’s song on his own. In all the online drama, it was gathered that kiss daniel unfollowed Davido and apologies to his manager.